The long expected debate for the future of legalized casino gambling across the entire country of Japan is coming ever closer to seeing Parliament. Two of the largest and most well known cities in Japan are racing to be prepared for the possibility of a long awaited bill to be debated in Japanese Parliament to determine the future of casino gambling in the country. Osaka and Tokyo's leadership are expectantly waiting for the results in order to be the first in a new chapter of the country's history as well as have the additional income that these businesses generate for their communities elsewhere in the world. The governor of Osaka, Ichiro Matsui, who also heads the Japan Restoration Party, has earmarked 170 hectares worth of land in anticipation of a successful pass for the bill. He is firm in his belief that moving forward while Parliament does the same is important to the development of the industry as well as the determination to be the first city with a regulated casino. On the other hand, Tokyo's governor, Yoichi Masuzoe, has yet to determine a definite site for the possible casino there. Popular speculation is that the Odaiba, in Tokyo's Bay area, would be the best possible location. Companies looking to expand their markets and share values are getting in on the preparations as well with Dynam Japan Holdings being one of the leading names. 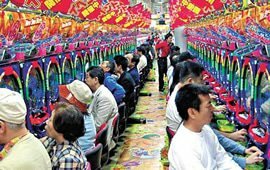 The operator of numerous Pachinko halls has been courting gaming operators with the intention of wisely choosing a partner to move forward with. Yoki Sato, the chairman of Dynam, is optimistic that there will soon be a successful joint venture operating casinos in Japan where projected estimates put Japan's potential at $40 billion annually, the third largest market globally. "Dynam's number one focus is on the casino opportunity in Japan," says Sato. He also gave information about which companies the talks have been including; SJM Holdings, Melcro Crown Entertainment, Galaxy Entertainment Group, NagaCorp, and Paradise Group have all been approached. Interestingly, the last of these, Paradise Group has responded and spoken publicly, stating that they would not be moving forward with the opportunity offered to them. Part of the plan that is being examined by these potential partners is that Sato and company are interested in developing not only the large cities but also more regional markets, such as Kyushu in the South and Hokkaido in the North.